After five years of waiting, hoping I will get a chance to raft across the kali nadi in dandeli, I left from Chennai with dreams. Rafting at kali nadi is seasonal and the last time I went there, I could only go for a jungle safari and some sight-seeing places. This time around I was mentally prepared for both, to come back with or without the experience of river rafting at kali river. 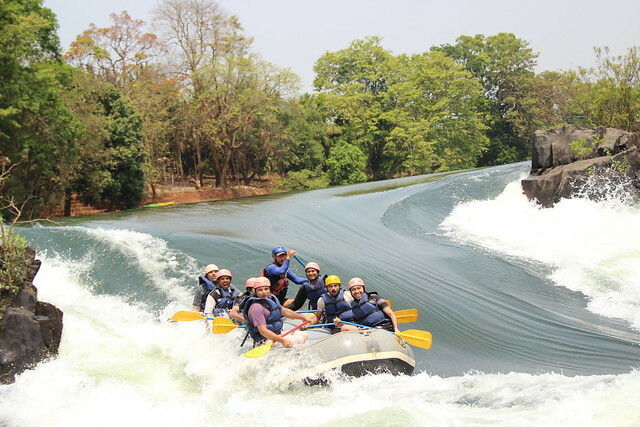 Meanwhile in the five year gap between my visits, I have already experienced the pleasure of rafting at barapole, madikeri. 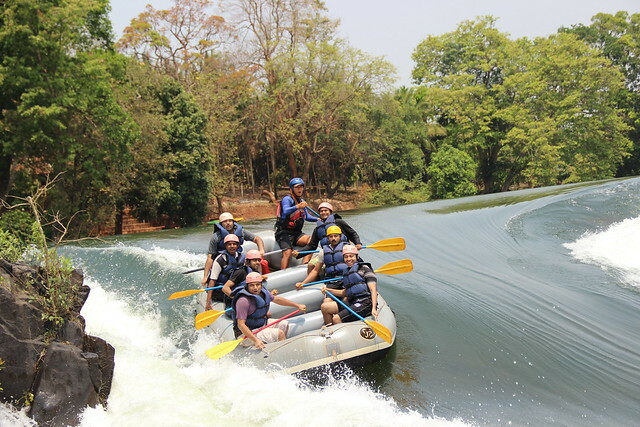 Even during that time our rafting guide mentioned about dandeli and brought back memories our uncherished dream at that time. Desire to raft at kali river became even stronger and waiting for the right season. I fell asleep dreaming about rafting at kali river and then reached dandeli at early morning. All my friends had already arrived and we reached the guest house. We were told we could not raft today because reservations are full. Anything may happen overnight, rains could play spoil sport, the power house dam might be shut down, blah blah blah, thought running down within me. We all slept in our rooms whole afternoon, and as soon as we woke up in the evening, we played with bow and arrow, Gun shooting, bridge crossing and zip lining. We played volleyball and then later in the night we danced around the campfire, forgetting about everything. Few of my friends were trying to photograph the fire in different perspectives. We went to sleep that night for our next day adrenaline rush. We all assembled at the forest range office at dandeli from where we were taken to a place(I forgot the name). We got into the raft. It was summer holiday time, many students have come in groups. There were camera men at different places, standing on the rocks in the river, to take right clicks. The experience of rafting is unforgettable memories for some, great experience for many, and just another adventure for the experienced, just another day of work for the guide,good business for the agents and so forth many people are linked. Picture speaks better than words and you can see them and wonder. and then this one was great too! For more photographs you can click river rafting photos in my flickr album. These photographs are great, taken from many points, where these camera men stand all day long and in the evening, you have to collect it from them for Indian rupee three hundred.